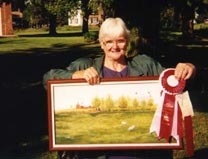 At the 1999 Williamstown Fair, the oldest Fair in Ontario on the weekend of August 6 to 8th, Williamstown, Ontario, Rhoda placed three of her paintings in the art show under, Nature, Portait and Landscape, getting 3 firsts and Best of Show in the Category concerned. The Curry House on right & Curry Hill Church circa 1890. Got a first Ribbon in the Landscape Category. Photo taken outside the Nor'Wester & Loyalist Museum, Williamstown, Ontario, in the evening sun. Mary Graham, Rhoda's mother circa 1924. 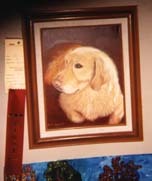 Got a first Ribbon in the Portrait Category. Sandy, a mixed Terrier, belongs to Rhoda's daughter Lynn. Got a first Ribbon in the Nature Category.